I enabled commenting for the Halloween Blog last year on September 28th ... so lets do the same bat-time, bat-channel! ;-) I'll be pulling everything out from the crawl space in the next week or two and the webcams will go live when I start setting stuff up. Here's a few pictures of the Halloween Display from last year. LET THE FUN BEGIN, ALL WE NEED NOW IS TO GET ALEK TO DECORATE FOR THANKSGIVING. Hey Alek, Think You'll get any of the White Stuff for Halloween? Alek replies at 07:15 - It would be nice to get some snow for Halloween ... but hopefully will hold off until everything is setup. Last year, there was 10" of snow the week before Halloween as seen below. I look forward to this every year! Thanks Alek! wow! Has it really been a year Alek? Very much looking forward to the 2012 display! Hope wendy and the kids are ok!? Can we expect any new lights this year? Alek replies at 09:14 - Only picked up a few new things last year at the post-holiday 75% off sale - see below. I'm hoping to get some upgraded webcams to enhanced the viewing experience. I'm not overly fond of Fall, but your Halloween cam is always a bright spot in my season! Thanks Alek!!! Hello Alek! Greetings from the Olympic Peninsula. Always look forward to this! Can't wait for this year! Thanks for the fantastic entertainment. Note that 2012 is an election year ... and THE HULK will be running for president again - support the Green Party Candidate! The Big Green Guy almost won in 2008 with 21,692 votes versus 21,821 for McCain and 21,996 for Obama. For 2012, he's hoping to SMASH Obama & Romney!!! Hey Alek! Any ideas as to when the cams will go live, so excited. Can't wait for them to be back! I cannot believe that it is this time of year again already!!! Cant wait to see the Halloween Decorations for this year!! Hope everybody is well in Colorado. Hulk for president! Hulk for president! Another year of lights. Thanks for your generosity Alek! He appeared one day.. Radio activity! For years, I've been using servers from Softlayer, the largest privately owned hosting company in the world ... and thanks to their help, the Controllable Halloween Decorations & Christmas Lights for Celiac Disease are now running on newer/faster hardware to enhance the experience for web surfers around the world. To summarize, they offer kick-a** servers, network, and customer support ... plus are some great people to work with - highly recommended. Alek replies at 21:02 - Yea, I was checking the wireless connectivity ... it's looking pretty good. I was also testing ONE of the new cameras ... sounds like a webcam manufacturer may loan me another one - hope it gets here soon! Also, someone commented "The shadows coming from your garage look like tombstones or gothic arches! Neat!" and the 2nd picture shows those ... that is pretty cool when the camera is in IR mode. 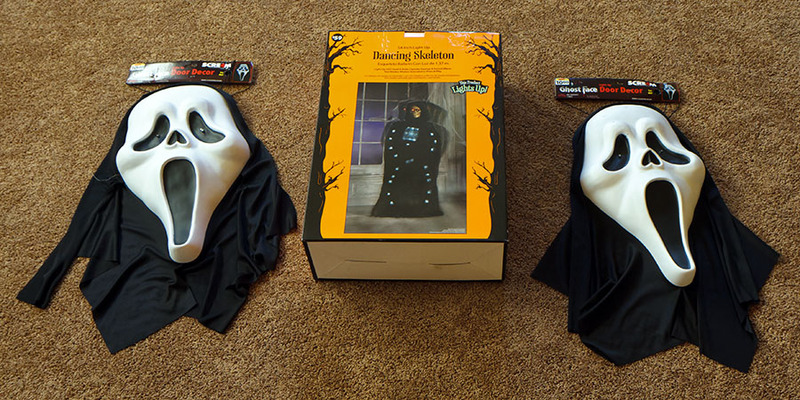 Halloween stuff should start getting deployed in the next day or two - WOOT! How Many Halloween Inflatables do you now have? Alek, what is the brand and model of the new cams you purchased? Just wondering is all. Great site, keep it up. Alek replies at 22:04 - First, thanks for the compliment ... and I'm running a bit behind schedule, but more stuff is going to start popping up in the next few days and I'll be turning on the webcams periodically. Ask me that webcam question again in a week or so ... one vendor has said they'll send me a demo, but want to wait until I have a chance to test it out. I'll try to answer the Halloween inflatables question in a few days when I move 'em all up from the basement. Pictures coming of the sign ... lets just say it might have something to do with the election - GO GREEN! Tonight I had some time to work on the icicle lights that go across the top-roof line. These actually stay up there for Christmas too ... and with 1,500 non-LED lights (someone want to buy me some LED's - lotsa $$$), there always a bunch of burned out ones during both holidays. Each strand is stored in a plastic bag, so I pull it out and plug it in. If a "sub-section" is burned out, I use the Lightkeeper Pro (or "Magic Gun" as I call it) and while it may take a number of "shots", it almost always lights it up. I then go through the strand and replace any burned out lights. Remember these are wired in series, so if one goes out (but the shunt isn't gone), then the other all have slightly higher voltage ... and shorter lifetimes. So you want to try to stay on top of it. How about checking my work and let me know if I missed any burned out bulbs - click on the image to see the full-res version! I've setup the skulls (watch time-lapse on webcam1 and webcam2. Webcam #2 used to be just inside the master bedroom window (who can make the funniest joke about that?!?) but as you can see in the picture below, it's now mounted outside the house. This is a slightly different angle and with it now being closer to the skulls, I had to tilt 'em backwards to make it look "right" ... I put in two safety wires. I also installed the lights on the upper roofline per this time-lapse. Hi Alek. I made it back for another year of viewing your wonderful cams!! I love this time of year and you help to make it soooo entertaining for me. Keep up the great work. Looking forward to "live cams" time. Alek replies at 19:11 - LED lights are EXPENSIVE ... especially when you need a bazillion of 'em. But HEY, if you want to donate some (see post #32), I'd be happy to use those instead! Uhf! I don't envy you're having to test all of those bulbs! I have a similar device and they're very very handy. It might not be very green, but I prefer the old style lights. Notice how much better they look on the cam too! Webcam2 has been turned on ... so you'll see the "Skull Twins" 7x24. I'll be turning on the other webcams periodically as I do setting up. is it possible to remove the music option on the page? It slows the site down considerably for us netbook users. Thanks for the consideration. Alek replies at 14:10 - Per D-14 in the Halloween/Christmas FAQ, just add a "?music=false" to the URL. How's it all going alek?! That Sign is Fab Alek!!! hulk for president sounds good, but homer for president sounds better to me! think about it, he would add a new day to the week called beer-day. it would be wonderful! Hulk For President! Smashing the Competition since 1962! LOL! All of it is pretty Scary to me..
OMG ALEK I SEE YOU JSUT PUT UP THE INFLATIBLES!!! what happened to the Rockies baseballs you displayed in years past? alek, i have to say that what you do is truly amazing! when the lights for both halloween and christmas are fully functional, my neices beg to go on and control the lights! we live in new jersey and i can honestly say you spread holiday cheer all across the world! looking forward for the X10 controls to be on!! and thank you for doing this as it does make alot of people happy!! Alek replies at 00:47 - Well dang, that was a super nice thing to say - thanks! I deployed a bunch of stuff in the front lawn this afternoon. It's pretty funny that less than 10 minutes after I walk out there, a neighborhood kid notices and says "HEY, whatcha doing?" ... so I asked him if he wanted to help ... which made his day ... and mine! ;-) Below is a picture of how things look so far and here's the time-lapse ... check out the dog at the very end going into the display. You can also watch the long version which shows me adjusting the camera angle initially and playing with the exposure at the end. yay! cant wait for the webcams to go live, keep up the good work Alek! Oh Man Alek... I Can't Make Up My Mind on Which Decoration I like Best.... But as Post 54 Has said Looking Good!!! The front lawn doesn't need much more work ... and the Haunted Office is all setup ... so mostly what is left to decorate is the front of the house ... BUT ... strong winds are forecast for Saturday. So I'm going to delay "opening the show" until Sunday since wind is the biggest enemy of holiday displays! i saw you guys putting up more halloween decor! keep up the good work! you make me and my family smile alek! We got a lot of rain, but the forecast winds never showed up ... and it's starting to clear ... so I'll turn things on tonight. The Haunted Office is all setup ... but still lots to add to the outside of the house and a few things aren't quite working yet. Alarm set for 1am for tonight! Excited!! when are you going to put the rest up? Yeehaaaaw!!! Halloween has officially begun! Lights look great, Alek! Alek replies at 00:13 - A couple people are getting carried away with electronic "attacks/ballot stuffing" ... but there is actually an analysis of the voting patterns and invalid entries are tossed - here's more about that along with some examples. Oh no! With all those decorations we won't properly see the grass grow! I think you should give them a warning and erase all their votes for the evening and then the 2nd time, ban the IP address. Alek replies at 08:45 - That's actually one of the icicle lights hanging from the roof line - you'll see it light up at night. BECAUSE ALEK WAS NOT PAYING ATTENTION! PLUS THAT IS YOU! YOU ARE THE SPAMMER ARNT YOU? HULK SMASH! um sure? but im here arent i....? While working on the Headless Horseman (when inflated, he should "giddy'up" better now), I noticed a critter on Frankenstein as seen below. Hello Alek! This is the seventh year that I follow your blog and your site. I look forward to the pictures of halloween decorations, and the crazy lights to be controlled ... a must! good work! Alek replies at 09:54 - That would be a cool addition - will keep an eye out for one at the post-holiday sales! Alek, I have a question. if someone is viewing your page and he happens to like 1 of the 3 candidates you have up, and he only wants to vote for 1 and not all 3. at what point would you scrap votes from that person? Alek replies at 20:17 - There is no hard-n-fast rule. Having fun on the website is the main priority ... but if you are really stuffing the ballot for a candidate (or stacking against one), then it is flagged - some examples here. Hello alek I read about x10 controls and it said that it takes 3/4 of a second for it to react. Is there a way you can set the webcams on maybe 1 second refresh rate or faster? Just a thought. Thanks for the lights they are great!!! hi, your blog is really nice but our birthday gifts collections is available now. The "boys" took over the Haunted Office last night and had some fun as seen in the time-lapse video. the votes disappeared on the screen! election called off? Yeah where is the streaming video? I thought you were a computer nerd type of person. If someone can go to ustream and have a high definition 1080p stream under the age of 21 then i'm sure you alek can do a little bit of standard definition streaming. With no problem whatsoever!!! You need to check the Frankenstein. The system continues to show it is losing air. Love people that that go all out for the holidays! We need more joy in this world! Alek, what's the make a model of the new cams? I know you weren't going to say before and wasn't sure about now. For those interested, webcam #2 is Viviotek FD8362 and webcam #1 is an old AXIS 215 that I picked up cheap on eBay. The later has some issues (plus maximum image size is 704x480), but is a much more challenging environment as it has to be outside. So HEY, if anyone has a spare high-end network camera they'd like to donate/loan (which especially at Christmas will be seen by a LOT of people), give me a holler. sweet upgrade! i will buy you a webcam if i win the lottery. love this site! what is the name of your town that the display is in? alek lives in the republic of boulder, colorado . With two weeks to go in the election, the HULK needs your Puny Human Vote. His platform/position is very simple - the Big Green Guy SMASHES!!! This message from the Puny Humans supporting HULK for President Committee. "I'm the Incredible Hulk and I approve this message" ... and don't make me angry! Maybe, just maybe you could lower cam 2 a tiny bit?? This site is such a wonderfully proactive way to help your children fight Celiac disease and bring simple happiness to so many people. Thanks for allowing me to play like a kid and best wishes to your family. Webcam 1 is covered in water droplets! Alek, just a quick question. When do you put the Christmas blog on? he usually does I think just before Thanksgiving.. or a bit earlier. hmm. maybe the voting results, daily and totals should be kept secret until the end of the night.. too many people on both sides of the tape stuffing ballots. perhaps if they were hidden, could reduce the stuffing..
Woohoo snow!! I want snow :( loving the decorations!!! HELLO MR. G, HOW'S IT GOING. CRAZY IN KC KINA HERE. LONG TIME NO SPEAK. CHECKING IN AGAIN. NOW THIS OLD GIRL HAS GRANDBABIES TO SHOW YOUR COOL STUFF TO. Poor Homer - he can't stand jup straight! What happened to the vote for hulk sign? Yea, we got a couple inches of snow - needless to say, the Hulk Brothers don't look too happy in the cold. Alek replies at 18:05 - I haven't run the ballot stuffing analysis for yesterday yet - will do a bit later tonight. So glad that the clocks have changed here in the UK, more chance of being able to watch when all the cams are on!!!!! Alek replies at 11:49 - Yea, the police stopped by to check out the Halloween Decorations ... here's the time-lapse ... was actually just a wrong address. I've been meaning to post some more pictures of the snow from this weekend ... so here they are. Weather for October 31st is forecast to be 70°F ... so should be a great Halloween night for the trick-or-treaters ... and certainly a lot nicer than what the unfortunate people on the East Coast will go through. You have some interesting reading material! Alek, you really should use THAT new picture as the picture you use for Webcam 3 when the system shuts down for the night. It's a much much better shot, better quality and up to date! Now we starting a very very spooky halloween night in Italy!!!!! BOOOOOO... HAPPY HALLOWEEN ALEK! In addition to the world's smallest pumpkin (my wife is proud of it), here's my trick-or-treats for tonight ... got some for both the little and big kids! Mmmm, the "big kid" treats look yummmmy! Happy Halloween!! Hi Alek, had a great halloween so far here in the UK, lots of trick r treater's, hope you all have a great night too and looking forward to the webcams coming on-line .. staying up late .. can't wait!!! Happy Halloween from Hungary Europe !!! looking busy Alek ...finishing touches? Happy Halloween! just 2 minutes to go !!! Nice display. Thanks and Happy Halloween! Yet another fun and crazy Halloween Night. My guess is close to 200 trick-or-treaters and I ended up opening my "reserve" bag of candy. The adults "treats" were appreciated with the favorite being the Pumpkin Pie Cream Liquor ... especially with the ladies. Below are a few snapshots from the webcams (love the Ghostbuster's dude walking up my driveway) - be sure to watch time-lapse videos from webcam1 and webcam2 and webcam3. Thanks Again Alek for the awesome light display! Your site has become a Halloween Tradition for me now while I wait on my own Trick Or Treaters. I hope that you raised lots of money for Celiac Research! Go GREEN Party! YAY! As sad as it will be to see it go, when can we expect the las night of controlling the lights, and the Halloween decorations to go down? Thanks for the wonderful lights this year, Alek! Time went by way to quick, but Christmas is just around the corner! Woooot! This whole idea of editing out the "stuffers" is incorrect. No one is going to come here and vote once. And because of the way you do the voting, if someone leans towards a candidate they should tend to turn on and off those lights, and everyone else can do the same so that's fair. THE BUTTONS SHOULD NOT REGISTER A VOTE UNLESS IT TURNS ON/OFF A LIGHT! No one is going to come here and vote once, that's a silly position to take. Enjoyed the lights though. I think the voting is fine. but to be honest I do like when there aren't votes because then I can turn on and off all the lights, ot just those who I prefer to vote for. Maybe a separate poll button that doesn't have any control over the lights? I like controlling ALL of the lights, to be honest. Can't believe it's the last night already! Been fantastic thanks Alek! NOOOOO PLEASE ALEK 1 MORE NIGHT! Enough boy.. Stop embarra**ing fellow Canadians! Sorry ... that's it for Halloween/2012. I may turn the webcams on tomorrow when I take everything down - hope to post a time-lapse video. Alek replies at 14:11 - Famous last words, but I'm pretty careful on the roof ... and I made it through another year without falling off the roof. If you missed the takedown action, here the timelapse videos via webcam 1 and 2. Looking forward to 4 years with THE INCREDIBLE HULK as President. Hey Romney guy, give it a rest, you've been brainwashed by idiot republicans. He won't win. Mark my word! Alek replies at 10:13 - Forgot to close an HTML tag - thanks for noticing and letting me know! I'm writing in my vote for Hulk tomorrow! Hee! Won't be long now till the real winner is announced.. I TOLD YA I TOLD YA!! Obama wins again! Alek replies at 08:12 - Yep - another 4 years with Obama. Needless to say, the HULK felt a little deflated this morning. Colorado was a pretty good supporter for the Democrats. Alek - What is that small round thing hanging off the edge of the roof on the left next to the inflatable hulk? Alek replies at 19:30 - That's just a lighted ball - there's one hanging on the other side of the house too. well, looks like it's come and gone. another fun Halloween and another Election. Thanks Alek for all the fun in October and some November. see you in 2013!